This range of bit sockets are from the Britool Hallmark range and are manufactured from the highest quality chrome vanadium steel. 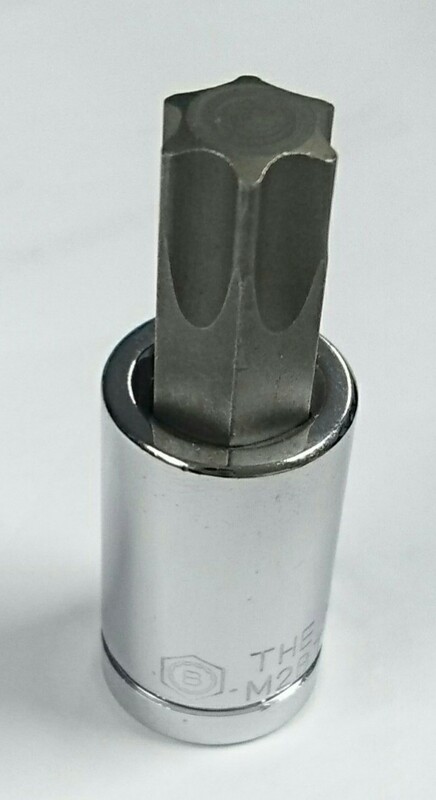 Each socket has a 6 point star (Torx TRX) shape screwdriver bit which is fixed into the socket and a ball retaining groove in each face of the square drive. This ensures a positive fit with all 3/8 inch accessories. This item has the newer Marque of Skill branding. THE HALLMARK RANGE WAS DEVELOPED BY BRITOOL IN THE 80'S FOR THE AUTOMOTIVE AFTERMARKET. IT HAS BEEN THE PROFESSIONALS CHOICE EVER SINCE. EACH TOOL IS STAMPED WITH A HALLMARK, YOUR GUARANTEE OF QUALITY. NB: Picture is generic and is used to illustrate item. It may be of a different size.